Make your wedding unforgettable with bespoke wedding flowers and guaranteed personalized service. I am passionate about designing bespoke wedding flowers that complement the personalities of the bride and groom at all budgets. 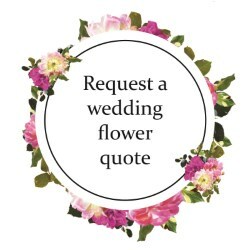 Every Bride is unique, so I will custom design your wedding flowers to reflect your style, your personality, your theme… your dream day ! Customized designs are all about attention to detail and using the best quality blooms sourced fresh from the market. I also offer wedding flower packages for bridal party flowers, ceremony and reception florals. I am committed to getting your wedding flowers perfect for you and making your wedding day truly memorable. For more information regarding the different styles of bouquets, floral arrangements and pricing , please see my wedding flower price guide. “Sandra is an incredibly talented florist. Sandra was great to work with – explaining different options, making suggestions when I needed guidance and being guided by my vision. I was extremely happy with the final product – the colours were so vibrant and tied all the outfits together perfectly. Your wedding flowers transform your wedding into a truly memorable occasion. Let me help you create your perfect wedding day with beautiful fresh wedding flowers. Please see my Wedding flower inspiration page for testimonials and photos of my wedding work. My Wedding flower guides have all the advice and inspiration you will need to choose your wedding flowers.